What goes bang in the night may not be such a mystery for residents in a group of Highland villages next month. The bright lights of West Coast villages are at risk of luring a threatened bird species to their deaths, say conservationists. Now villagers are being asked to report any of the Manx shearwaters who clatter into their homes at Mallaig, Arisaig and Morar area. 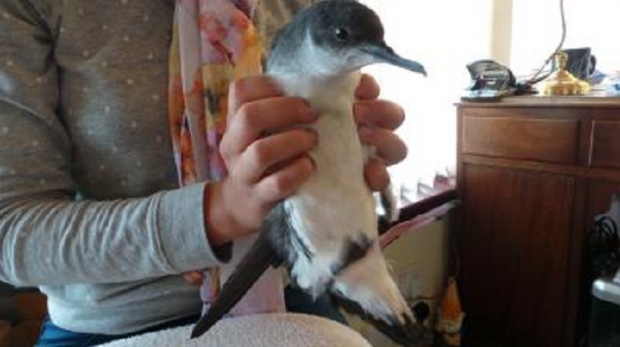 The bright light danger faced by Manx shearwaters comes at the very start of their incredible 6000-mile journey. The chicks fledge from the mountains of the Isle of Rum before flying to their wintering grounds in South America. The birds are incredibly long-lived with the oldest recorded from ringing studies at 50 years, 11 months and 21 days. However each year some of the young birds can become disorientated by outside lights left on in Kinloch on Rum and surrounding villages, but particularly Mallaig on the mainland. They often crash land close to the light source and many are then killed by gulls, crows, cats or dogs. Now before next month’s fledgling season, an appeal has been made for people to be on their alert for the crashing birds. Last year 131 of the birds were rescued in and around Mallaig – because northerly and easterly winds have blown them out to sea. Usually several hundred are saved in Mallaig, Morar and Arisaig and in 2012 there was a record 709. Martin Carty, who organises the volunteer rescue network, has appealed for people to notify him of any crashed chicks. “They tend to kick off in the first week of September with the peak in the second and third weeks. But it all depends on the weather and other things,” said Mr Carty.